Jay Epae, real name Nicholas Epae, was a Maori pop vocalist from Manaia, Taranaki. Considering the number of singles he released, he is relatively unknown in New Zealand for his songs, but more remembered as the author of Maria Dallas's huge first hit, "Tumblin' Down". His first single was released on the American Mercury label. It came out in 1960 and was "Hawaiian Melody"/"Putti Putti". This was followed in 1961 with "Hula Cha"/"It's Driving Me Wild". 1962 saw "Wassa Matta You"/"Dance With Me Lulu" and "Hokey Pokey Hully Gully"/"Jungle Speaks". A switch to the American Capitol label gave him two more singles in 1962, "Coffee Grind"/"My Girl" and "Surfin On Waikiki"/"Patu Patu". Jay went quiet on the recording front after that, until 1966 when he picked up a recording contract in New Zealand with Viking Records. 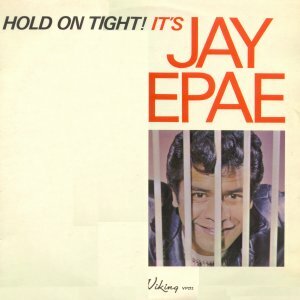 With them he released a single "Hold On Tight"/"The Creep", an EP and an LP called "Hold On Tight It's Jay Epae". "Jay Epae is a young man going places in both the record and song writing worlds. Jay was born in New Zealand and left for the USA in 1957. His first break-through was the recording of 'Putti Putti' which sold over a quarter of a million copies in Scandinavia alone. Listening to these mighty tracks, one immediately senses the strong influence of New Orleans blending with the relaxed Polynesian feel. Jay's own compositions, "Hold On Tight", "Creep", "Tumblin' Down", "What Can I Do", "I'll Cry Tomorrow" and "Under The Palm Trees" show off his natural song writing ability. May you hear a lot more of Jay Epae." One last single was released on Viking in 1967 called "Your Tender Touch"/"You've Got What It Takes". 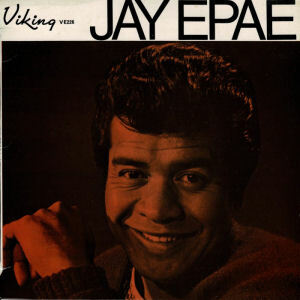 In a period when cover versions were the overwhelmingly the norm, Jay Epae not only recorded his own material, the sublime "The Creep" being a good example, he wrote a massive 1966 chart hit for Maria Dallas. Viking Records' Ron Dalton remembers the seeming ease with which Epae came up with the huge Dallas hit, "Tumblin' Down". Only one day after Dalton requested a song, Epae re-appeared with a tune, no guitar, no words on a sheet, the artist had written it in his head. He then sang it to Dalton, who promptly ushered Maria Dallas into the studio to record it, with Epae helping out with the arrangement. The follow obituary appeared in the newspapers after his death on 29th July 1994, aged 61. "Kiwi singing talent rediscovered too late". The man who wrote the Maria Dallas sixties hit "Tumblin' Down" is more fondly remembered in Sweden than in New Zealand. Warren Barton reports on the sad end to Jay Epae's burst of fame. When producer Owe Eriksson decided earlier this year to make a television documentary about the pirate station that in the sixties liberated Swedish radio, he launched a hunt for the man who was its superstar. His name was Jay Epae and Eriksson found him in New Zealand. Would he, asked Eriksson, return to Sweden and sing just once more the catchy little tune that 30 years ago propelled him to the top of the pops for an astonishing 41 weeks on Radio Nord. He said he would and got a haircut, but never showed for the television special. What Jay Epae's disappointed middle-aged Swedish fans didn't know was that the aging Maori entertainer had only a few weeks earlier been rediscovered by his own family, whom he hadn't seen in 14 years. They had found him in the back streets of Brisbane, down and out and ill. That's why they brought him home and why he couldn't make the trip. Instead he sang one night for nieces and nephews that he hardly knew and for strangers in a Wellington karaoke bar. They were to be his final, farewell performances. The talented little man from Manaia died last week at the age of 61, better remembered at the other end of the earth than at home where his biggest claim to fame is writing "Tumblin' Down" which won the Loxene Golden Disk Award for Maria Dallas in 1966. In Sweden, Jay Epae is remembered for "Putti Putti", which was on the flipside of a recording he made of "Hawaiian Melody" in 1960. The 45 sat around for months till suddenly it started getting air time on Radio Nord which for two years bombarded the mainland with pop music and commercials from the MS Bonjour, an old herring schooner anchored just outside the territorial limits. The result was near hysteria, "Putti Putti" sold 50,000 copies and Epae toured Sweden. "He flared like a super nova" remembers Svante Liden, a reporter on Aftonbladet in Stockholm, "and disappeared as quickly". Apparently he went back to Australia where he worked for most of his career in clubs before dropping out of sight about 15 years ago. "We didn't know where he was till someone saw him in Brisbane earlier this year" says his brother Roy, who now lives in Melbourne. "I went up to Queensland and found him". Roy brought him back to Wellington to be near his sister Tui and Hector, one of two brothers who also made a career in show business. Wes was an impersonator with the Maori Hi-Fives. He now lives in the United States and works the cruise liners, but Hector, who once played piano and sang with the Maori Volcanics, hasn't performed in years. He was there when Jay grabbed the microphone and started to sing in the downtown karaoke bar. "It was beautiful," he says. "Man , that voice of his...". It's a voice, according to Svante Liden, that's still being heard in Sweden. "As a matter of fact, 'Putti Putti' came on the radio just the other day and everyone in the office stopped to listen. When the Song had finished one of my younger colleagues said with a smile, "Things must have been a hell of a lot better in the old days, no?". "Maybe they were, I said. At least for Jay Epae they were."